If you are looking for information on the Unlimited MedSearch franchise business opportunity, Unlimited MedSearch healthcare recruiting franchises or Unlimited MedSearch franchising , then you have come to the right place. Enjoy incredible profit potential and growth ... Own your own company. Be your own boss. Set your own hours. With Unlimited MedSearch, you can do all of that and so much more. Enjoy the flexibility of either working from home or opening an office and building a recruitment team of your own. Unlimited MedSearch gives you the flexibility to make the choice that's right for you and your business objectives. When you become an Unlimited MedSearch franchise owner, you immediately become a part of one of the country's most lucrative industries. What's more, you'll start at the top, with the prestige and reputation of a national leader. Healthcare business is booming, and no other field has as much long-term growth potential. And as an Unlimited MedSearch franchise owner, you'll enjoy the kind of earnings potential usually only available to highly trained medical specialists and surgeons - without ever even stepping foot in medical school. In fact, the only requirement to achieve remarkable growth and income as an Unlimited MedSearch franchise owner is the desire to succeed. There are no other prerequisites. Unlimited MedSearch provides all the training, technology and ongoing support you need, including immediate access to a broad range of established national clientel, an unlimited number of open positions and the industry's leading candidate sourcing software. Quickly finding the right candidates is key to healthcare recruiting success - and Unlimited MedSearch has the resources you need to rapidly fill available positions. Unlike the outdated approach used by most recruiting agencies, Unlimited MedSearch minimizes the amount of time you'll need to spend on job boards, social networks and cold calls. As an Unlimited MedSearch franchise owner, you will surpass the competition with software that allows you to easily search for and rank candidates. Plus, with continual updates, you'll never have to worry about missing an opportunity with outdated information. As important as the technological resources are, they are just one part of what makes Unlimited MedSearch unique. With an Unlimited MedSearch franchise, you gain more than a mere computer database. You gain access to a vast network of people and a broad referral system based upon years of professional experience. Unlimited MedSearch has developed a powerful presence at national job fairs, referral events and university recruiting exhibitions. We have done all the legwork to make the connections - as a franchise owner, you reap all the rewards. 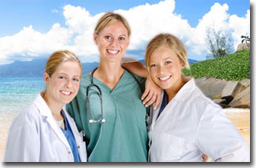 Why should I invest in an Unlimited MedSearch franchise? As a smart entrepreneur, you know a good investment when you see one - and considering the current and long term state of the healthcare industry, there's no better investment than an Unlimited MedSearch franchise. All across the country, hospitals and healthcare facilities face a growing staffing crisis. There is simply too much demand and too little supply. Plus, as an Unlimited MedSearch franchisee, you'll also enjoy the benefits of national brand recognition and the ability to either work from home during the hours you choose or open your own office.